All interested researchers and students are invited to attend. No registration is required for the short course. Seating is limited and is available on a first come, first served basis. The Martian subsurface contains key information of astrobiological, geochemical, climatological, and ISRU interest that cannot be obtained with surface missions alone—but such data are needed in order to help complete the search for life on Mars started by the Viking landers more than four decades ago and to prepare for human exploration. 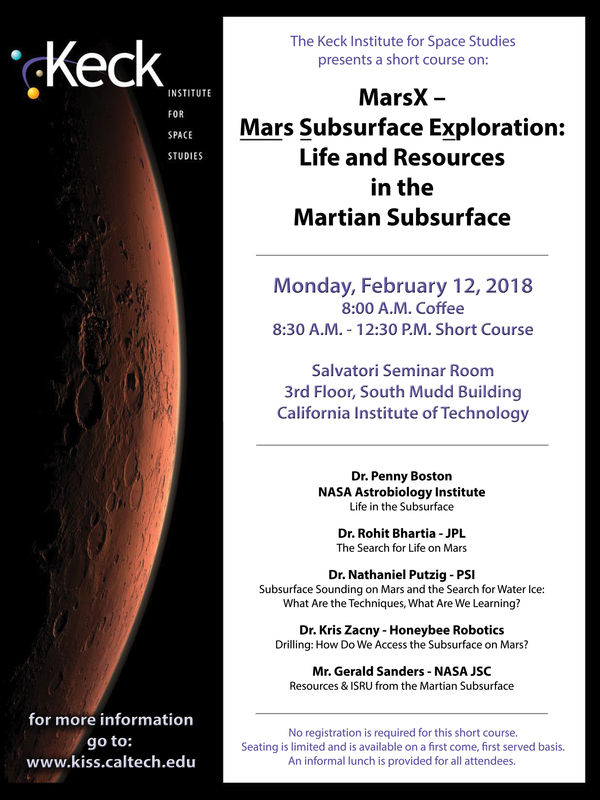 This short course presents essential pieces of knowledge—from astrobiology and hydrology to robotics and instrumentation—needed in order to tackle the challenge of making deep and wide Mars subsurface access a feasible reality in the next decade. PSI Subsurface Sounding on Mars and the Search for Water Ice: What Are the Techniques, What Are We Learning? Honeybee Robotics Drilling: How Do We Access the Subsurface on Mars?